Hello everyone!!! Hope all is well with you!!! We have been shopping, shopping, and shopping...wrapping presents, and decorating for Christmas!! I have got to get started on my Christmas cards, too, so this week's Color Throwdown was my inspiration for this years design....thanks, Tammy, for the beautiful colors this week!!!! Taylored Espressions...it was cut out of taken with teal cardstock and adhered over the washi tape background. The sentiment is from the Taylored Expressions Wings of Joy set and the twine and enamel dots finish it off. Such an easy design and flat for mailing....just 30 or so more to go!!! Remember, you don't have to use the exact colors.....use what you have as long as they are close to the challenge colors and be sure to add CTD322 to the keywords section when you upload your cards to an online gallery so we can find your creations!! OOOOOH! LOVE this Joan! The rows are PERFECT and I adore the die cut sleigh!!! LOVE! Just saw your card at The Colour Throwdown and wanted to say I think it is fab...wish I'd made it! Love the colours so I will be joining in but the washi tape rows are inspired! Santa die cut is the perfect accent. 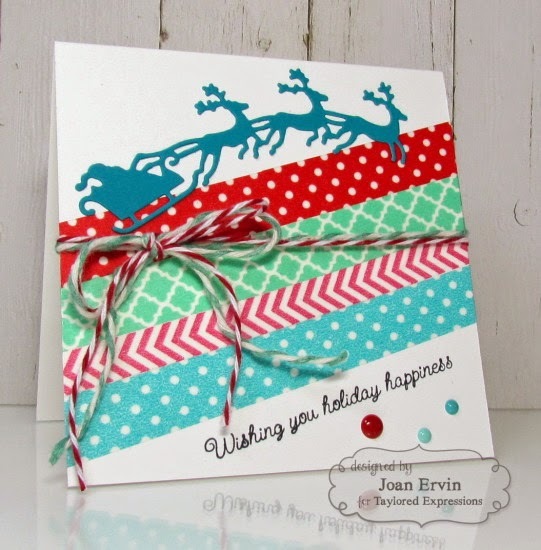 Love the striped background and the sweet Santa sleight die-cut. Fun and cheerful. Love those colorful stripes and sweet Santa with sleigh!! It's wonderful Joan!! 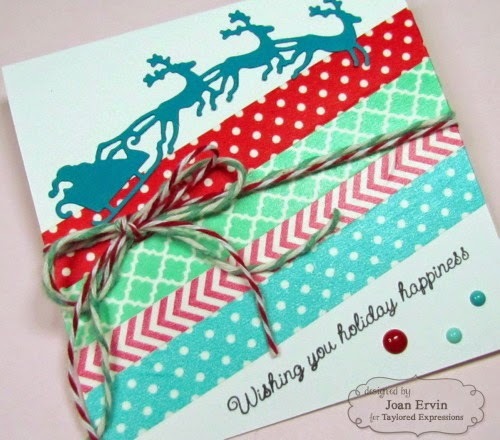 So clever to use Washi tape to bring in the colors, Joan! And I LOVE that sleigh die cut! Fab card!